Robert Cordes setting up a trail camera for follow-up investigation of a large wolf-like canid sighting near Rangeley, Maine. Photo by Charles Hulsey. ​Many of us enjoy viewing wildlife, but some species can be difficult to find. For those species that are secretive, nocturnal or perhaps rare and endangered, we must rely on remote technologies to detect their presence. Trail cameras provide a way to get close to nature without being there and influencing animal behavior. 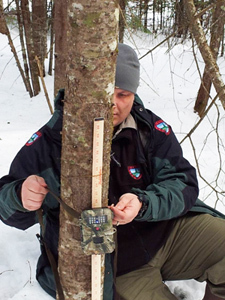 In this podcast, our host, Rod Williams, will be interviewing Robert Cordes, a biologist from the Maine Inland and Fisheries Department, on how to use trail cameras to view wildlife. Robert Cordes is an assistant regional biologist and will provide insights for nature enthusiasts about the use of trail cams, tips to increase success in capturing images of wildlife on your property and detailed information on the different technologies available. 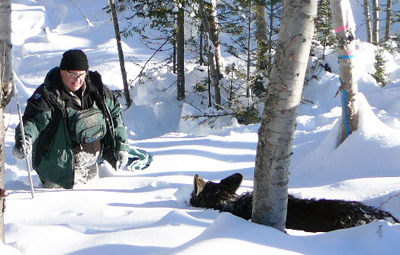 Robert Cordes preparing to immobilize a compromised female moose calf near Saddleback Ski Resort, Maine. Photo by Charles Hulsey.